Our loquat tree has had a wonderful long season this year. There are still plenty of golden fruit on the tree in mid December. The birds get quite a few, but there are enough for me. This morning I had freshly picked loquats with yoghurt for breakfast. I love the sweet-sour flavour. The loquat (Eriobotrya japonica) is a fruit that doesn’t make sense in the industrial food model. Loquats are incredibly easy to grow in home gardens, and they have no commercial value. You won’t find them at the supermarket, or even at the farmers’ markets. They don’t keep well once picked – they start to discolour after a few minutes. The best way to eat loquats is straight off the tree, a few at a time, as you wander past. I have friends who pick a whole (small) branch, and the fruit keeps for a couple of days that way. The other thing about loquats is that they have two or three stones inside each fruit, so there is almost as much stone as flesh. So they are a bit fiddly to cook with. Not difficult, but not totally quick and easy. 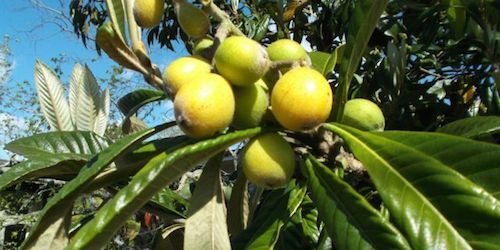 Loquat trees are related to quinces and apples. They originally come from south-central China, but they have made their way all over the world. They thrive in subtropical to mild temperate climates. 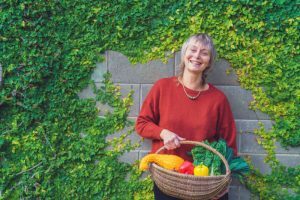 The leaves and fruit are greatly valued in traditional Chinese medicine. This is the first time I have had a loquat tree and I greatly appreciate it. Most days I pick two or three fruit to have with my yoghurt or kefir for breakfast. Also known in my household as “ersatz muesli”. Half a cup of kefir or yoghurt, three loquats, sometimes a mandarin from the tree in my front garden, a sprinkle of toasted sunflower seeds and pumpkin seeds, a tablespoon of ground flaxseed and a few raisins. When I’m organised I soak some chia seeds for half an hour and add those. Grated fresh coconut would be good too. This is a beautiful orange-red, which is strange, because ripe loquats are bright yellow. Place all ingredients in a big saucepan and simmer until the chutney is thick. This will probably take two or three hours. Seal in sterile, hot jars. This is a variation on Damson Gin. It’s a beautiful gold colour, with a subtle, fruity flavour. It goes well with crushed ice and a splash of ginger syrup. Prick loquats with a fork. Place in jar. Add sugar and pour in vodka or gin to cover. Screw on lid tightly and shake the jar well. Shake jar daily for 1 week. Leave as long as you can before drinking – ideally 2 months.